As the Railways are aware, based on recommendations of the 7th CPC, the benchmark for grant of MACPs benefit has been enhanced from “Good” to “Very Good” w.e.f. 25.07.2016, for which, three (03) years’ APARs are taken into consideration. The step has debarred certain number of staff from this financial upgradation. 2. Since the earlier “Good” benchmark for MACPs was applicable upto 25.07.2016, the employee, having “Good” Grading in their APARs for the previous three years before 25.07.2016 may not have had a reason to represent against the Gradings given, as they met the then prescribed criteria of benchmarking for MACPs. 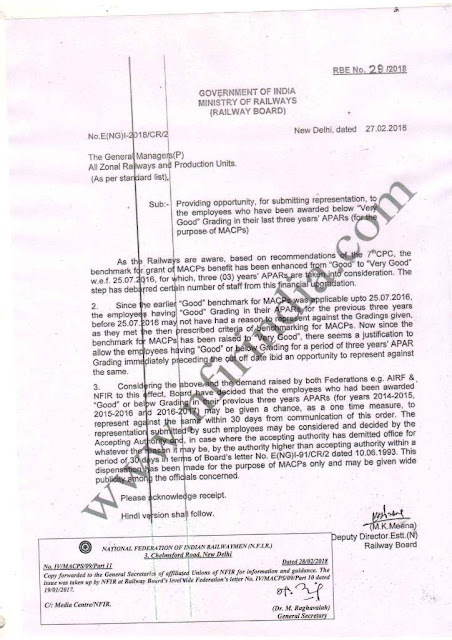 Now since the benchmark for MACPs has been raised to “Very Good”, there seems a justification to allow the employees having “Good” or below Grading for a period of three years’ APAR Grading immediately preceding the cut off date ibid an opportunity to represent against the same. 3. Considering the above and the demand raised by both Federations e.g. AIRF & NFIR to this effect , Board have decided that the employees who had been awarded “Good” or below Grading their previous three years APARs (for years 2014-2015, 2015-2016 and 2016-2017) may be given a chance, as a one time measure, to represent against the same within 30 days from communication of this order. The representation submitted by such employees may be considered and decided by the Accepting Authority and, in case where the accepting authority has demitted office for whatever the reason it may be, by the authority higher than accepting authority within a period of 30 days in term’s of Board’s letter No. E(NG)I-91/CR/2 dated 10.06.1993. This dispensation has been made for the purpose of MACPs only and may be given wide publicity among the officials concerned.